The e-tron starts at 79,900 euros in Germany. The SUV is pictured at a press event in Abu Dhabi. ABU DHABI -- Audi will make its full-electric cars as profitable as the rest of its lineup by utilizing the economies of scale offered by parent Volkswagen Group, Audi's finance chief Alexander Seitz said. The brand is working with Volkswagen Group sibling Porsche to develop a new EV platform called PPE (Premium Platform Electric) platform for electric cars. By jointly developing the PPE architecture with Porsche, Seitz said development costs and capital expenditure could be reduced by more than 30 percent versus a go-it-alone strategy. "I would not be able to sleep well at night if we did not have a path that takes us to a level of profitability on these cars that is comparable with those of a well-equipped diesel,” he said. 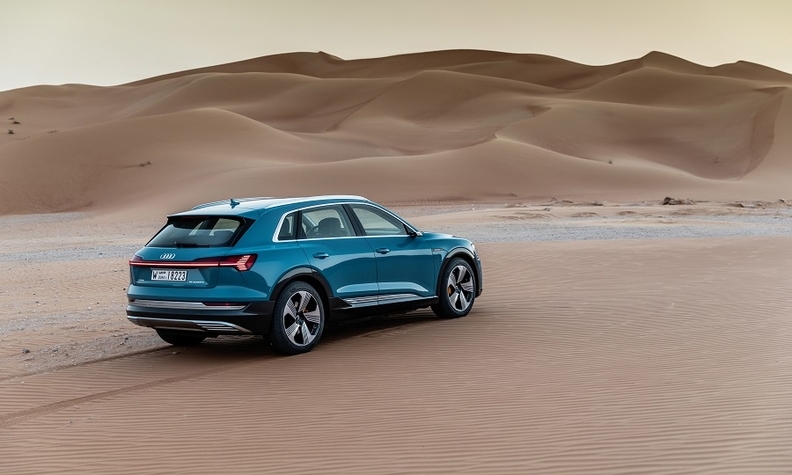 "And you can assume that I am sleeping well," Seitz said at a press even in Abu Dhabi t for Audi’s e-tron battery-powered SUV, which the automaker will start delivering to European customers in March. Audi is counting on the e-tron’s 400-plus-km (248 mile) range to entice buyers to switch to the EV from internal combustion engines. Customers will be able to begin configuring their e-tron at the end of this month, an Audi spokeswoman said. It starts at 79,900 euros in Germany and will be priced from $75,795 in the U.S. where it goes on sale in the second quarter. Citing competitive reasons, Seitz would not comment on profitability levels for the e-tron. The e-tron shares some features with VW Group's MLB Evo platform that underpins models such as the Audi A8 and Q8, Bentley Bentayga and Lamborghini Urus but is largely a separate development. Lower maintenance and repair costs due to the simpler mechanics of the vehicle also would ensure its resale values will at least match those of a combustion engine car, regardless of concerns over the life cycle of the high-voltage traction battery.